From the South: Take I-94/I-43 north to the Kilbourn Avenue exit (Exit 72C). Take Kilbourn Avenue east 4 blocks to the intersection of Kilbourn Avenue and Water Street. From the North: Take I-43 south to the McKinley Avenue exit (Exit 73A). Turn left (east) on McKinley Avenue (stop light). Continue east on to McKinley Avenue and then onto Knapp Street (crossing river). Turn right (south) on Water Street and continue to intersection of Water Street with Kilbourn Avenue. From the West: Take I-94 east through the Marquette Interchange and onto I-794 eastbound and exit left (north) at the Van Buren Street exit. Go north on Van Buren Street 5 blocks to Kilbourn Avenue. Turn left on to Kilbourn Avenue and follow it 5 blocks west to the intersection of Kilbourn Avenue and Water Street. Click here for detailed directions to City Hall from your home address; then, click on "To here" and type your address, City and State; then click on the "Get Directions" button. 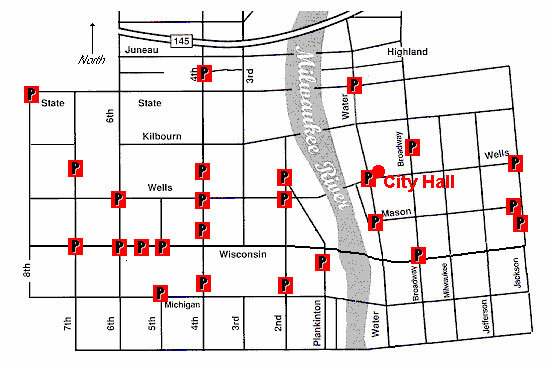 In addition to the parking listed in the above link, limited parking for persons attending meetings in City Hall is available at reduced rates (5 hour limit) at the Milwaukee Center on the southwest corner of East Kilbourn and North Water Street. Parking tickets must be validated at the first floor Information Booth in City Hall.